The problems and issues arising from globalization are difficult to resolve, in part because our ways of conceptualizing the conflicts and responding to them are inadequate. This book fills this gap, conceiving of globalization as a consequence of economic, political, technological, scientific, and cultural changes. 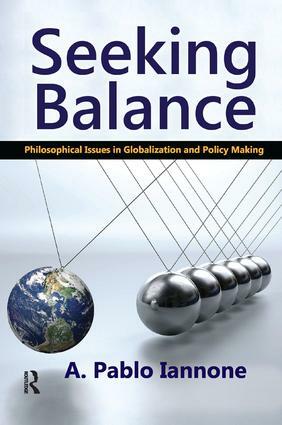 A. Pablo Iannone provides a taxonomy of globalization processes, investigates the consequences of each, and formulates a comprehensive approach for dealing with them.While his emphasis is philosophical, this is not a single-discipline book. Rather, it belongs at the intersection of philosophy, economics, political science, and technology. Its discussions address issues concerning globalization and correlate the processes of fragmentation and dislocation in a realistic manner.Iannone focuses on concrete and current cases, from the global economic and financial issues posed by the multi-centered nature of contemporary business and technology, through the pressures of ever increasing information overload across the planet. He explores the environmental and social challenges associated with current Amazonian development and its significance to weather patterns on Earth. He considers the issues surrounding the use of robots in war from Pakistan through Mexico, and the militarization of space. In short, the approach, while based on theoretical concerns, is solidly grounded in highly practical applications, which are global in their implications. Globalized Cyberwars: How Much Autonomy Should Robotic Weapons Have?